Ontario is eliminating key energy-conservation programs and overhauling the provincial regulator as it continues to search for ways to reduce power rates and keep the promise made by Doug Ford in last year’s election campaign. Energy Minister Greg Rickford outlined a series of measures Thursday, including revamping the former Liberal government’s Fair Hydro Plan, but acknowledged that the actions will achieve only modest cost savings for consumers. He reiterated his government’s commitment to lowering electricity rates by 12 per cent but said it has to take a “measured, systematic approach" to doing so. For now, the government has ordered the Ontario Energy Board to hold any increases to the rate of inflation, though local utilities have already filed their rate requests for next year and are typically asking for an annual increase of less than 2 per cent. The seven conservation programs to be eliminated include subsidies for modern lighting, such as LED bulbs, more-efficient air conditioners and furnaces and upgrades to commercial refrigeration equipment. The government will also centralize the delivery of eight programs aimed at businesses, low-income seniors and First Nations communities; they will now be run by the Independent Electricity System Operator (IESO) rather than local utilities, which will lose $150-million a year in bonus payments. All told, the cuts are expected to save $442-million over three years in a system that generates revenues of more than $21-billion a year. The energy-efficiency programs that are being eliminated are designed to help consumers lower their electricity use. Critics say the government’s cuts will ultimately mean greater usage and higher costs for households, businesses and public-sector institutions such as schools and hospitals. The previous government had pursued a “conservation first” policy that aimed to keep a lid on electricity demand in order to reduce the need for expensive new sources of power in the future. While the province currently has a surplus of capacity, the IESO has warned it faces a shortfall for peak-hour demand as early as 2023. “Energy efficiency is the best bang for the buck for the people of Ontario," said Corey Diamond, president of the advocacy group Efficiency Canada. "Saving a kilowatt hour is cheaper than spending to generate one. Cuts to energy-efficiency programs mean reducing the lowest-cost option in our electricity system.” He added that energy-efficiency programs are both popular with homeowners and labour-intensive, creating jobs for heating and air-conditioning technicians and installers. Former premier Kathleen Wynne introduced the Fair Hydro Plan two years ago as she faced mounting pressure over steeply rising electricity prices, especially for rural Ontarians. The plan cut average residential rates by 25 per cent by extending the payment period for the system’s long-term debts – a move that provided short-term relief but added $21-billion in long-term interest payments. 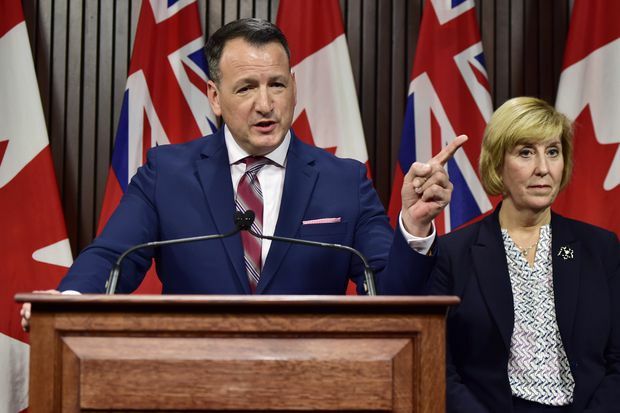 Mr. Rickford said the government is keeping the short-term subsidies in place but will shift the financing of the plan from the electricity system to the general revenues, as recommended by the provincial Auditor-General. That move adds $1.8-billion to interest charges this year. The government will also require utilities to identify the subsidies on consumers’ bills in order to show “the real cost of electricity,” the minister said. The government is also acting on a recent advisory report to overhaul the Ontario Energy Board with a new board of directors and chief executive, separate from the quasi-judicial commissioners. It issued a series of directives meant to reduce the length of regulatory hearings and the costs of local distribution companies regulated by the board. The Ontario Energy Association, which represents the utilities, welcomed the changes. The improved structure for the OEB "will help instill investor confidence and therefore promote innovation and job creation in a sector going through a technological transformation,” association president Vincent Brescia said. He added that his members believe conservation programs represent important low-cost options for the system in the future.